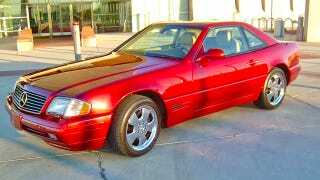 Before leaving the Pittsburgh Steelers for a new job with the Arizona Cardinals, defensive back coach Ray Horton decided to surprise a cook in the Steelers' cafeteria with a present — Horton's own 1999 Mercedes-Benz SL500. When he saw Matthews, he said to him, "Hey, I need a favor from you. How much money you have in your pocket?" Matthews said, "I got $20." Horton took the money, looked at it and said to Matthews, "Sold for $20!" And then Horton handed Matthews the keys to his car and told him to keep it. The following day, Horton had Matthews drive him to the airport and sign the title for the 66,000-mile Mercedes, which is worth about $18,000, depending on how much coaching Horton put into the car. It's an awesome gesture worth cheering, and we welcome Matthews to the world of Mercedes ownership. Step one: Play good defense, or start saving $6,000 for a new transmission.